Many incidents of Wolfe's siege of Quebec reveal the immense contrast between the methods of warfare of to-day and those of two centuries ago. The story of the battle on the Plains of Abraham, in particular, illustrates, in many curious details, the way in which our soldier forefathers fought. 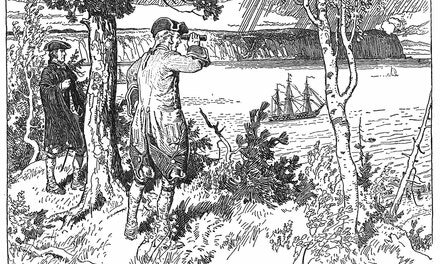 By sunrise on the 13th of September, 1759, Wolfe's army had gained its position on the heights to the west of the city, and taken ground in a line extending from the brink of the cliff above the St. Lawrence to the edge of the slope descending to the valley of the St. Charles. Out in the open, in front of the line of infantry, were placed two six-pounder guns, which had been dragged up the cliff by the sailors of the fleet. The six British battalions were drawn up, two men deep, with a slight interval between each battalion, but each man rubbed shoulders with his comrades, and the rear rank was but a pace behind the front. This disposition, Wolfe's own invention and an innovation at the time, was the first "thin red line" in military history. Conspicuous in the line were the Fraser Highlanders, with kilts and Scotch caps, and the Grenadiers, the bombing sections of their day, the tallest and heaviest men in each regiment, wearing high conical hats, who, in addition to the usual infantry weapons carried grenades, small cannon balls with fuses attached which they lighted, and threw by hand as they advanced. All wore red coats with facings of yellow, buff or blue, with white knee-breeches and stiff pipe-clayed belts and gaiters. The French army poured out from the city gates and formed about half-past nine o'clock on the rising ground about a quarter of a mile from the British. Montcalm, hoping to be able to break their thin line before they had time to entrench themselves, arranged his men six ranks deep on a narrower front, five battalions of French regulars in the centre with three battalions of Canadians and some Indians on the flanks. Some of the regiments were dressed in white uniforms, while the remainder wore blue. Both armies carried their flags into battle, and all along each line fluttered the colours of each regiment, the blue and white with golden fleur-de-lis of the French and the red and white crosses of England and Scotland on the blue field of the British ensigns of that day, forty years before the cross of St. Patrick was added. Conspicuous in a new uniform, which he had put on that morning, Wolfe walked along his line giving his final instructions. The British were ordered to stand firm, without firing, till he gave the word. They were armed with muzzleloading, flint-lock muskets, and for this engagement each man loaded his musket with two bullets. Beginning at the right, each battalion was to fire a volley in turn all down the line, the rear rank firing over the shoulders of the front. As each battalion discharged its volley it was to advance twenty paces, loading as it went, and then halt and fire continuously and rapidly until the order was given to charge with fixed bayonets. These orders were obeyed to the letter. The French regulars advanced in perfect paradeground formation, halted and fired a heavy volley, and again came forward, while the Canadians and Indians fired continuously on the flanks, from under cover of bushes and hollows in the ground. Not a shot came from the silent ranks of the British infantry in return, though many men fell all along the line and Wolfe himself received two wounds, which he concealed from the knowledge of his troops. Only the two small guns out in front fired grapeshot into the advancing columns, until on the nearer approach of the enemy they were dragged back behind the British line. Nearer and nearer came the French, till but forty paces separated the opposing forces. 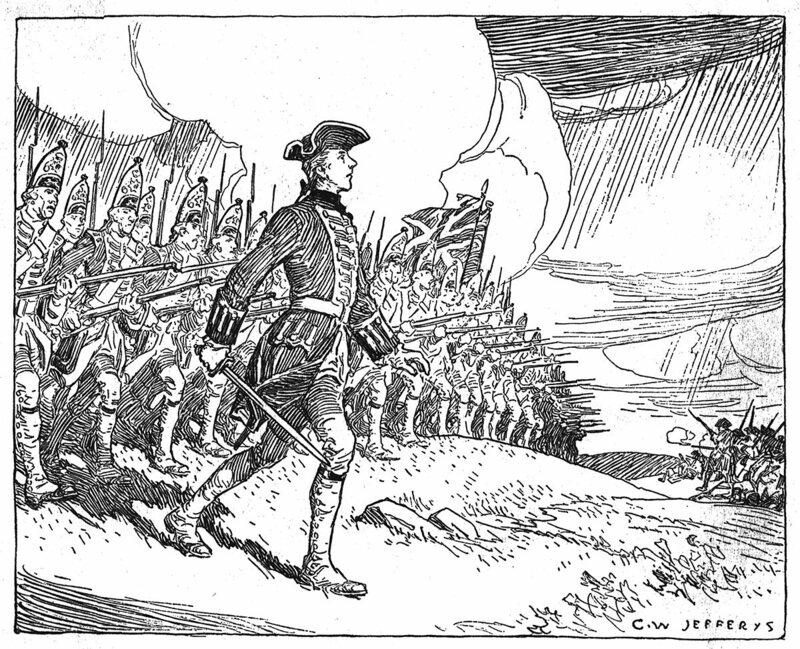 Wolfe gave the order to fire to the Louisbourg Grenadiers, at whose side on the right of the line he stood. Down the thin line ran the double-shotted volley, from battalion to battalion, in quick succession, delivered with such precision that each discharge sounded like that of a single great gun. Under this terrific fire, poured into them at so short a distance, the crowded, six-deep, French battalions were shattered to pieces, and when, within five or six minutes the smoke had cleared away, they were seen to be in hopeless confusion. Wolfe gave the order to advance and began to lead forward the Grenadiers. Almost at the same moment he received his third and fatal wound, and was carried dying to the rear, while his troops rushed forward to complete the rout of the broken enemy. Montcalm, in a vain effort to stem the retreat, received his mortal wound, and was borne along with the fugitives within the walls of the city. Fifteen minutes sufficed to decide the issue of the encounter, with consequences to the destiny of our country and the course of human history which mark it as one of the most important battles of the world. The picture shows Wolfe at the moment of the advance of the Grenadiers. His figure is long-bodied, meagre and ungainly, his profile oddly triangular, with turned-up nose and retreating chin; his red hair is tied in a long, straight pigtail. Such are the details one gathers from contemporary portraits and descriptions. He wears a sharply~cocked black hat, laced with gold braid, a new bright red coat, with long skirts looped back showing the inner lining of blue satin, tight knee breeches over which are drawn gaiters reaching to his midthigh and gartered below the knee. He carries a short straight cross-hilted sword or hanger, without a guard. The actual sword, of this shape, said to have been carried by him on the day of battle, is preserved in an English museum. The Grenadiers wear high caps with a tuft at the peak, decorated in front with a crown with the royal monogram, G.R., beneath it, and immediately above the brow the figure of the running white horse of Hanover on a red ground. The weather of the morning was changeable and alternated between sunshine and rain. Showers are falling in the distance over the valley of the St. Charles. This work includes two images. 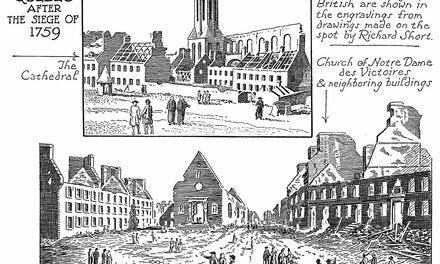 The top image is of The Cathedral in Quebec as it appeared after the siege of 1759; while the lower image is of the Church of Notre Dame des Victoires.